Shahouna Dutton, 24, aka "Oopie from Bullet Town"
“Oopie from Bullet Town” arrested again with loaded handgun – just weeks after NJ Bail Reform FREE release involving assault and threatening of restaurant workers. Jersey City, NJ – Shahouna Dutton, a 24-year-old ex-con, was charged by the U.S. Attorney’s Office for possession of a weapon during an investigation into witness tampering involving a murder case – just two weeks after being released under NJ Bail Reform for assault. Dutton was released and FREE TO GO in late February during an incident where Dutton climbed through a fast food restaurant’s drive-through window to assault workers. During the incident, Dutton assaulted workers while claiming that she was “Oopie from Bullet Town” and threatened to have employees shot by gang members. 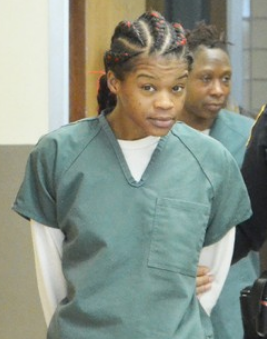 Shortly after the restaruant incident, Dutton was released and FREE TO GO under NJ Bail Reform after the Arnold Foundation’s “Pretrial Risk Assessment” tool determined she was not a danger to the community or a flight risk and therefore should not be subject to any accountable release – just a “promise” to appear. Dutton has prior convictions in 2013 (aggravated assault) and 2016 (attempted aggravated assault). After her release, and during an investigation into witness tampering, authorities discovered a loaded .22 caliber handgun in Dutton’s bedroom during a search of her home. Now a federal case, Dutton remains detained. The Jersey City woman who made headlines when she climbed through a fast food restaurant’s drive-through window to assault workers is now in trouble with the feds. Shahouna “Oopie from Bullet Town” Dutton has been charged by the U.S. Attorney’s Office with possession of a weapon by a previously convicted felon, U.S. Attorney Craig Carpenito announced. She was charged with a similar offense, plus witness tampering, by authorities in Hudson County on Feb. 22; and the federal charge was a result of the Prosecutor’s Office investigation into witness tampering in a murder case. The trial has been postponed. When she appeared in Superior Court in Hudson County last week, Dutton was ordered to home confinement electronic monitoring. Dutton was then arrested at her home by special agents of the FBI and she was detained after making her initial appearance before U.S. Magistrate Judge Mark Falk in Newark federal court. Hudson County Prosecutor’s Office investigating the witness tampering executed a search warrant at Dutton’s home and found a loaded .22 caliber handgun in Dutton’s bedroom, authorities said. Since Dutton has two prior felony convictions in New Jersey, she is prohibited from possessing a firearm under federal law. The felon in possession of a firearm charge carries a maximum potential penalty of 10 years in prison and a $250,000 fine.